Kyle Andrews is back and better than ever with this near-perfect electro pop record. Kyle Andrews has progressed as a producer and songwriter considerably from his last full-length effort Real Blasty. 2010’s “happy” EP Kangaroo was an example of the heights Andrews could hit if he just dropped the pretension and embraced his pop leanings. 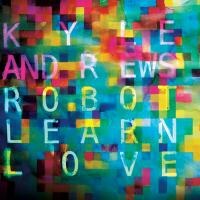 On his latest effort, Robot Learn Love, Kyle dismisses the awkwardness of “Indie” in favour of fun electro pop. The result is one of the most engaging and marvelously produced album this year, by any artist (period). The album begins with a blippy synth riff that you can’t help but instantly love. “Make Me Feel Human” explodes with such gusto that you are forcibly propelled into the journey you know you are about to embark upon. As the rest of the album unfolds, especially through the magnificent tracks “Heart U 4 Ever” and “Bombs Away”, you feel like you are dipping and diving through one long rollercoaster, speeding ahead with carefree energy and joy. It’s exhilarating, it’s like a male version of Robyn. Andrews is cool, uncomplicated, sincere, enticing and engaging. Everything you could ever want from a magnificent pop record, and not once do you have to feel embarrassed about liking it. The sweet quirk of the record and Kyle’s distinctive style are not necessarily groundbreaking. It’s something that's characteristically indie. But the difference between other indie artists and Andrews is that it’s absolutely clear that Andrews is being himself through and through. He’s indie because he’s not mainstream, but you get the impression that he really doesn’t care where his music falls -- he’s having fun and he wants you to have fun too. It’s difficult to highlight one track from the next because quite simply, they’re all stellar. Each track is carefully and passionately crafted in such a way that as the album plays out you find yourself saying “this is the best track! !”, only to change your mind once you hear the next track. Kyle earned my attention with Kangaroo but after some investigation into his back catalogue, I was skeptical about his abilities. With Robot Learn Love, Kyle has earned my heart.